US Speedo brings you the highest quality gauge face kits for your vehicle. These are not aftermarket quality parts, they are better than the original manufacturer parts. Along with these gauges, US Speedo completes the custom gauge area by offering replacement lenses and needles for several makes and models. They put the finishing touch on that brand new gauge face from US Speedo! These small, rechargeable lights are ready when you are. They conveniently charge in most cigarette lighter outlets, and are made from the brightest LEDs available. Several different accessories and packages are available. These gauge faces have to be seen to be believed! Not only are they custom built for your Harley Davidson, some models glow fiery orange at night. These definitely will have your bike being the talk of the talk the next time you're at that local bike night or car show. Is the case of your stock key fob broken? Are you looking for a bit more style for your keys? 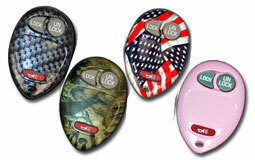 Check out the designer key fob cases from New Key Fob. With most makes and models available along with several styles to choose from, these are an easy customization to your own style.